President Reuven Rivlin today (Tuesday) addressed a special plenary of the Ukrainian Parliament marking 75 years since the Babi Yar Massacre. The address was part of a State Visit to Ukraine by President Rivlin which began earlier this morning with the President laying a wreath at the Tomb of the Unknown Soldier in Kiev, and at the Holodomor memorial. 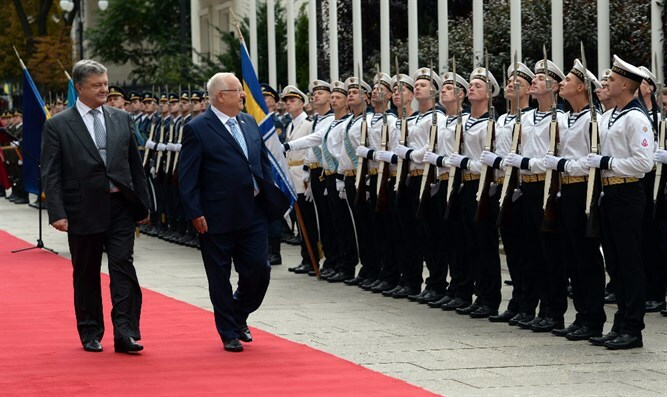 The President and First Lady Rivlin were received by President and First Lady Poroshenko at an official welcome ceremony which included an honor guard and military parade, a 21 gun salute, and the playing of both national anthems. The two Presidents then went on to hold a working meeting after which they delivered media statements. President Rivlin said, “The blood of our brothers and sisters, that was spilled at that dark time, places upon us the duty to remember, and teach the whole world, about the dangers of not just anti-Semitism, but of all hatred, and all racism. While we mourn the past, we must also speak about the present, and look to the future." Later, President Rivlin was received at the special plenary of the parliament. He continued, “Ladies and gentlemen, every year we mark Holocaust Memorial Day in Israel and around the world by reading out the names of the victims, "Everyone has a name". But there are names, there are many names, that we will never know, despite incessant efforts to locate them. My wife's cousins - children, toddlers, infants, and babies, are left unnamed. There is no one in the world who knows the name. They were once here but are no longer among us. Many thousands of Jews who were shot, butchered, slaughtered, burnt and buried alive in Babi Yar also have no name. They became extinct under the sky – without anyone bothering to register their names. They are anonymous. Then, as now – it was autumn. The valley was green. A hand squeezed the trigger, again and again. More than 33,000 Jews were killed over two days, in a cruel and brutal death. He noted, “the Jewish people have a long history interwoven with Ukraine. In Kiev, in Lvov, in Odessa, and in many other cities spread across Ukraine. Here a large part of the Jewish people lived for more than 1000 years. Here, a bastion of world Jewish culture was created. Here they influenced and were influenced by the neighbors living around them, the people of Ukraine. Here on Ukrainian soil two of the most important modern Jewish movements grew and flourished; Hassidism and Zionism. Here some of the greatest of the Jewish figures grew and worked; the Ba’al Shem Tov, Rabbi Levi Yitzchak of Berditchev, Ahad Ha’am, and my ideological teacher Ze’ev Jabotinsky.